Damavand Mountain is 5671 meters (18,605 feet) high. It is the Highest Volcano in Asia and it is officially classified as the number five by elevation in the Volcanic Seven Summits (V7S). This mountain is home of rare animals and plants. Some of the living species on the slopes of this volcano are not found anywhere else on earth. Damavand is a popular target for mountaineers and mountain tourists. They like to trek this volcano because they like the beautiful conical shape, the prominence and the isolation of a volcano which is not attached to another mountain and also because of its less difficulty in summer season. If you are interested to trek Damavand, it is not so difficult to find where to go! Damawand is located in the province of Mazandaran 80 Kms driving distances north east of Tehran, Iran. It is situated in the middle of the Alburz Mountains on the south seacoast of the Caspian Sea on Haraz Road between the capital city Tehran and Amol city. Geographical location and the GPS Waypoint of the peak is: Latitude 35-57-19 N, Longitude 52-06-37 E.
Polur Mountain Resort is the best beginning point to Damavand Tour either from south route or the west route. This copmplex campsite is not only a shortcut to the mountain but also the ideal place for accommodation and acclimatization. Polur mountain hut is made and administered by Iran Mountaineering and Climbing Federation. Trekking Damavand the highest peak in Asia and a respectable member Volcanic Seven Summits in the world is a life time memory. The experience of trek to this giant volcanic summit with a team of mountaineers from the entire world when Damavand Weather is good is very rewarding. It is essential to get all the necessary info before actually attempting this prominent mountain in Persia. Find comprehensive information in English for hike, trek, winter climb and ski tour in Damavand Info. Damawand is a favorite summit for summer trekking. It is one of the most difficult peaks for winter climbing. Despite the fact that it has mild trekking slopes, but freezing temperature and strong winds makes Damavand Winter Climb very difficult. South route is the best side for winter sports such as Damavand Ski Touring, snowboarding and winter climbing. Other faces are more difficult. For a safe trek to this mountain you must be very experinced, physically very fit and well-equipped. You need a high skilled experienced mountain or ski guide. You need a good timing and good weather. You must be well-supported and be ready for any risk. Visit also Damavand Winter Warning. Visit also Damavand Vip Tour, Damavand Economy Tour and Damavand Forum. 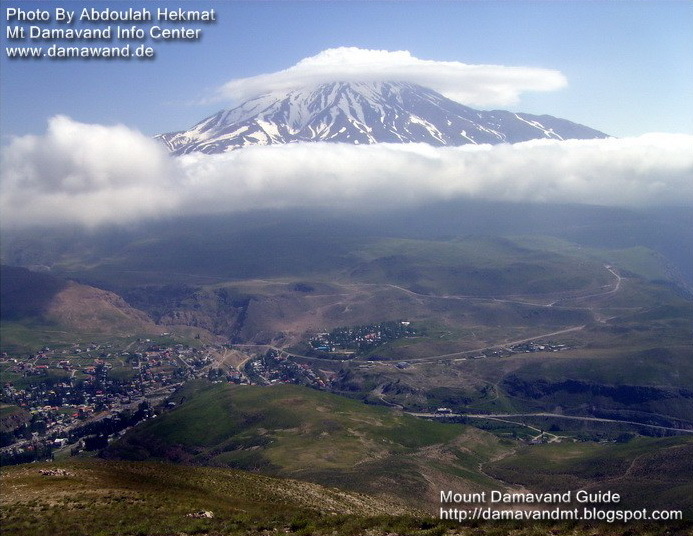 Damavand Info: (our website) and Mount Damavand Guide: (our weblog). 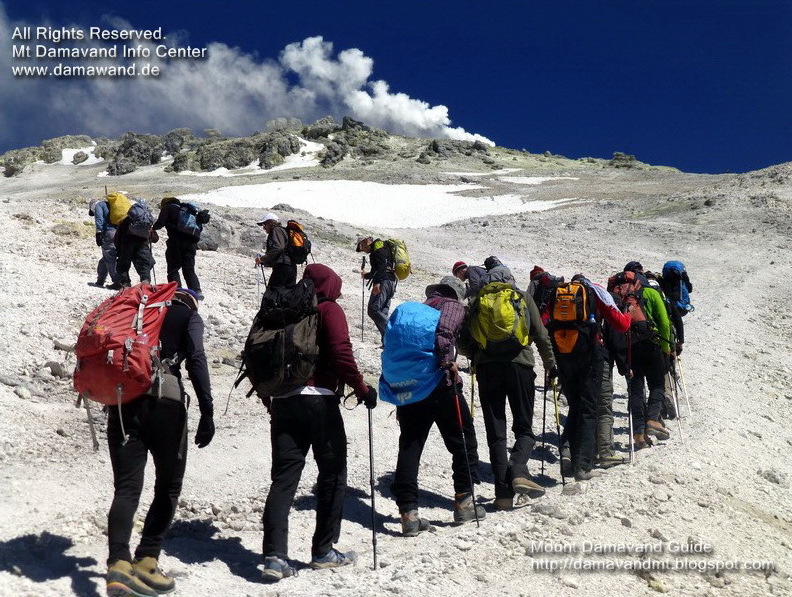 Summer trek and winter climb to Damavand. Hiking & trekking Iran mountains. Guided ski touring and snowboard expedition to Alborz Mountains. Guided travel tours to Persian historical and cultural sites. Damavand Iran, Damavand Trek, Damavand Hike. Sightseeing and outdoor tour organizer Tehran. Iran Mount Federation campsite and resort. Alpine style mountaineering Iran. Ski touring to Iran ski resorts. Best source of information for safe ascends to Damawand Mountain Information for Iran adventure travel tour. All the material on this website is protected by copyright. All Rights Reserved. © Damavand Iran.